She stood strong and brave as the axe fell, blow after blow, slowly severing her from her familiar roots. In the moments before release, she bade farewell to the fellow plants in her fertile corner of the earth, blessed them, and thanked them for their company and care. She let go of the fear of the unknown. She let go again when she felt herself falling, and as she landed upon the forest floor without fanfare, she let herself be absorbed by Gaia’s welcoming embrace. She realized that she was still breathing. Still alive. The sunlight and moisture and breeze, the cherished green moss that graced her fallen trunk, soothed and comforted her. It was only the beginning of a new story, one she’d never imagined. The one who’d wielded the axe rested his hands on her trunk, and she found herself surprised by his tenderness. Surprised by the energy she felt flowing through him and into her. Until this moment, her only job had been to wait – to root, to grow, to breathe. Now, her future was in the hands of something outside of herself, her purpose unclear except for what it wasn’t. The message was clear and she let go, yet again, embracing the freedom of the unknown, trusting the man who worked with such purpose, bolstered by the knowing that she could never be truly separate from Gaia. In the weeks that followed, each piece that had come from her was molded by the hands of that tender man – a talented artisan – into intricately carved boxes, to be sent off into the world. Oh, the adventures that were had! One box landed in the hands of a woman, whose home was nestled among the trees and earth. She felt as though she’d returned to her precious forest, and that this woman was on a journey, not so unlike her own. She could feel the apprehension as the woman opened the box, connected with her energy, closed it, and then opened it again, closed it. Whatever was to be placed within was troubling the woman. She waited, noticing the heat from the wood stove, the moisture from the shower, the cool damp on a rainy day when the fire hadn’t been lit. Yes, she was still very much alive. At last the woman returned to the box and held it before opening it. She filled her hands with stones and crystals of all shapes and colors and sizes and nestled them within before carefully closing the box again. It was like being bathed in light and celestial music. She absorbed as much of the glorious gift that she could, even as she imbued them with her own gifts, all while knowing that the woman had something else to add. Those stones were not the source of fear. She wasn’t wrong. 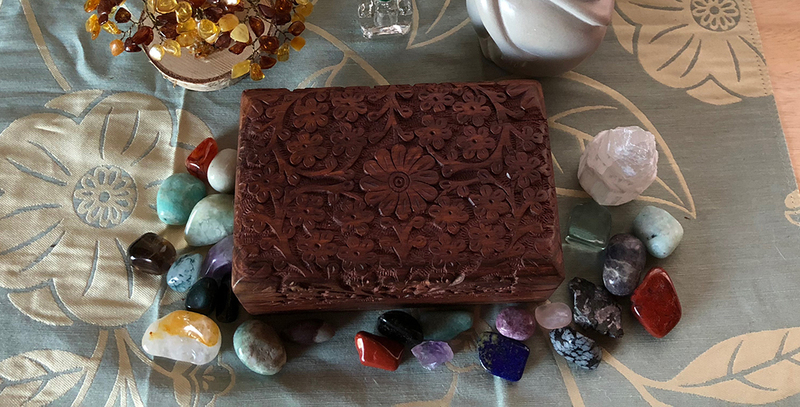 A few days later, the woman came back with another box and removed the crystals one by one, holding each in gratitude before placing it in its new home. It was days, again, before the woman reappeared, this time with a small stack of cards. Yes, she thought, these pieces of paper hold the key to the fear. The woman sat down, slowly, and pulled up her legs as she rested one card after another upon her right knee and proceeded to write a few words on each. She felt as the woman surrendered, gathered up those small cards between her palms, touched them to her forehead and breathed.